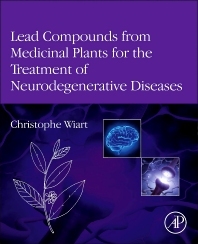 Lead Compounds from Medicinal Plants for the Treatment of Neurodegenerative Diseases is the second volume in the series, Pharmaceutical Leads from Medicinal Plants. This book includes key pharmacological and chemical evidence to support the selection of promising pre-clinical candidates for the treatment of neurodegenerative diseases. This important addition to the natural product and drug discovery literature contains the history, synonyms, medicinal uses, phytopharmacology, pre-clinical potential, and rationale for each plant selected. By providing critical evaluation of pharmacological data, mechanisms of action, and structural requirements for the development of future neuroprotective agents, this comprehensive reference is a beneficial resource for industry and academic scientists whose research focuses on neurodegenerative drug discovery and development. Dr. Wiart has been studying the medicinal plants of Southeast Asia for the last 16 years. He has published several articles in peer-reviewed journals and lectured and presented on pharmacognosy in international symposia. He is a member and co-editor of the European Journal of Ethnopharmacology and editor of dePharmacog.net. He also has one patent filed for pharmaceutical preparations from rainforest plants. Dr. Wiart is currently a world authority in Asian medicinal plants.